I started collecting salvias more than 20 years ago and now have one of the largest collections in the UK. For a long time I had thought that salvias were the rather gaudy, small, red plants commonly used in bedding schemes. On visiting a friend's garden, I saw a spectacular Salvia sclarea var. turkestanica and I was hooked. The aim of this website is to share my observations and pictures of my favourite salvias. Here you can read a little about how my interest in Salvias started and the aims of this website. On this page I will always highlight the latest photographs and descriptions to go on display in the photo-gallery. 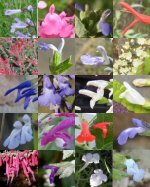 This is where you will find all the Salvia photographs and descriptions. They are arranged alphabetically to make it easier for you to find the particular Salvia that you may be looking for. I have just added twenty one Salvia photographs to my gallery pages. You can view these latest ones on my "latest" page, from the top menu. They are also indexed alphabetically. If you would like to contact me you can email me at the below address. I would be pleased to hear any comments you may wish to share with me, regarding either Salvias or my website.